In June of 1998, Owen and Kerri visited Germany for a ten day tour of beer. Below, you will find photos and information about most of the wonderful places we visited. We flew into Stuttgart on a very inexpensive sale fare from Delta Airlines, rented a car, and then drove to Munich, Bamberg, Kulmbach, and Berlin. We used information about beers and bars in Munich and Bavaria from the British CAMRA guidebook "Good Beer Guide to Munich and Bavaria." Pick up a copy if you are planning a trip to southern Germany. We found it difficult to find information about beer in Berlin on the internet, so we hope you especially enjoy the following information about Berlin's good beer spots. 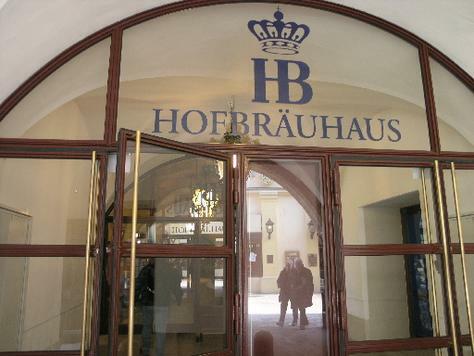 We enjoyed fine lagers at the famous Hofbrauhaus in Munich. Diana Sundermann, Janosch Benz, Hans-Jurgen Sundermann, and Jutta Sundermann in the Gasthaus Wendel in Berlin. The Sundermann's are wonderful friends who were gracious enough to show us around Berlin. Hans-Jurgen is a great beer aficionado in his own right. Donisl, corner of Marienplatz and Weinstr. (nice Hacker-Pschorr pub with Salvator Double Bock on tap). Hofbrauhaus, Platz 9 (don't miss this experience -- see photo!). Weisses Brauhaus, Tal 10 (beautiful Schneider restaurant and pub). Weissbierkeller, Bayer-str. 1 (interesting Lowenbrau place). Chinesischer Turm, Englischer Garten Park (beer garden in the middle of a tranquil park). Brauereigasthof, Zornedinger-str. 2, Aying (pub at the Ayinger Brewery -- great stuff!). Brauerei Gasthof Oberbrau, Marktplatz 18, Holzkirchen (nice brewery and pub in a suburb of Munich). Alte Post, Marktplatz 10a, Holzkirchen (same comment as directly above). Schlenkerla, Dominikaner-str. 6 (oh yes -- home of the incredible, smoky Rauchbier -- see photos). Brauereigaststatte Spezial, Obere Konig-str. 10 (very quaint pub with Rauchbier a bit milder than Schlenkerla). Mahrs Brauerei, Wunderburg 10 (big bar near the brewery -- produces nice lagers and wheat beers). Braunbierstubla, Obere Muhlbrucke 3 (once owned by monks -- now has a nice dark lager and bock). Kaiserdom Stubla, Urban-str. 18 (decent Kaiserdom beers -- was once called Burgerbrau Stubla). Frankisches Brewery Museum, Michaelsberg 10f (dusty old museum in a cellar once used by monks to lager beers -- very entertaining -- pub/restaurant next door). Zunftstube, Oberestadt 4 (small EKU pub in old town). Stadtschanke, Holzmarkt 3 (Monchshof pub with a nice menu -- even vegetarian stuff!). Monchshof Braugaststatte, Hofer-str. 20 (huge pub attached to the brewery -- cool beer museum too -- see photo). Schweizerhof, Ziegelhuttener-str. 38 (nice EKU pub next to a closed brewery). Gasthaus Wendel, Richard Wagner-str. 5 (great beer selection with many tasty pilsners and Berliner Weiss -- see photo). Mommseneck Pub "The House of 1000 Beers", Mommseneck-str. at Giesebrecht (has a beer menu that goes on and on -- some rare beers are here). Warsteiner Pub, Meineke-str. at Lietzenburger-str. (very attractive pub with great pilsners). Biergarten am Neuen See, in the Tiergarten near the new lake behind the zoo (beautiful locale with a walk-up beer stand). Hackescher Markt (famous upscale shopping, eating, and drinking center in what was once East Berlin -- not much good beer, but worth a look). Kerri with Wendy and Rich Tucciarone enjoying the awesome Rauchbier in the Schlenkerla bar in Bamberg. Rich is a past brewer at the Breckenridge Brewpub in Denver, CO. We ran into them purely by luck! Kegs of Rauchbier are hauled upstairs to the serving area of the Schlenkerla every few minutes as the last ones are drained. Bamberg folk go through a great deal of this smoky stuff! Owen found a keg slightly too large to fit into his carry-on bag at the Museum of the Monchshof Brewery in Kulmbach. This modern museum even had a multi-media film about beer (all in German, of course). E-mail us to receive our E-Mail Brewsletter. Click here to return to the "Brewtopia Events" Main Page.